Nicholas Boileau-Despréaux was instrumental in reforming the customs of French poetry that prevailed in his lifetime. He was greatly influenced by Horace and was good friends with playwrights Jean Racine and Molière. Nicholas was born on November 1, 1636 in Paris. The surname Despréaux originated from a small property at Crosne near Villeneuve-Saint-George. Nicholas was the fifteenth child of Gilles Boileau who worked as a clerk in the parlement. His mother died when he was two years old. Due to the enormity of the family, Nicholas seems to have suffered from neglect and experienced ill health. This may have colored his perspective on life and in his writing. He was educated at the Collège of Beauvais and went on to study theology at the Sorbonne. He changed his studies to law. He was called to the bar on December 4, 1656 but after a short trial he left the profession in disgust complaining of deviousness. His father died in 1657 and left him a small fortune which allowed Nicholas to devote himself to writing. His early work in poetry was not his best. He wrote his first satire in 1660 and it was followed by eleven others through the rest of his life. He attacked and parodied the most famous poets of the time, openly revolting against the methods of writing poetry. He also showed his own capabilities in using the French language poetically. He followed this work with a poem in praise of Molière and a prose satire on the elaborate romances of the time. His manuscript of this piece was read at the time but was not published until 1713. He attended salons with Molière, Racine and others to discuss literary questions. He remained a constant friend and supporter to Racine and Molière. In the late 1660’s, Boileau wrote more satires and epistles. His work called “Épîtres” gained favor with King Louis XIV who asked him to attend court. The King asked him which verses were his best and Boileau began to recite some unprinted lines in praise of the King. Louis immediately gave him a pension of two thousand livres. 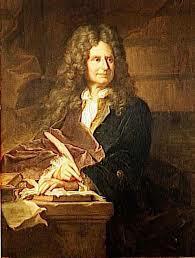 In 1674, he wrote his masterpieces laying down the code for all future French verse and criticism. He took a job as historiographer to the king in 1677 and his production of poetry and criticism slowed down. He did continue to write more satires and epistles, some of which caused controversy with other writers and the church. In April 1684 he was admitted to the Académie française and then only because King Louis wished it. In 1687, he retired to a country house he had purchased in Auteuil. In 1705 he sold the country house and returned to Paris and lived with his confessor in the cloisters of Notre Dame. He published a satire attacking the Jesuits in verse that same year and then began working on a complete and definitive edition of his own works. But the Jesuit fathers went to the King and got his privilege to publish his work withdrawn and demanded the suppression of the objectionable satire attacking the order. The distress of this may have hastened Boileau’s death on March 13, 1711. Numerous editions of his work were published during his lifetime. He is described as being benevolent, warm, kindly, honest and outspoken. Most of his criticisms have been adopted by his successors and his work would also influence English poets for many years. Super post, thank you Susan!!!!! !